I never realized the importance of skin care routines until I finally started up a regimen that I can now swear by. Before I got into skincare products, I used to just wash my face with some random facial cleanser or just a splash of water every now and then. Last year, however, I noticed my skin was not as bright as it used to be I started to see that I was getting dry patches under my nose and my face was starting to break out in places it never used to before. I began trying a bunch of different products to try to get rid of the problem areas I tried coconut oil, lotions, specific creams that claimed to get rid of what I was dealing with but none of them worked, in fact, it made them worse. So one day, I looked up some higher quality products and I found that Benefit has its own line of skincare products and almost every product has at least a 4-star rating. The next day, I went to Ulta and got a kit that had a little bit of every product. To say the least, all of the products helped my skin tremendously! 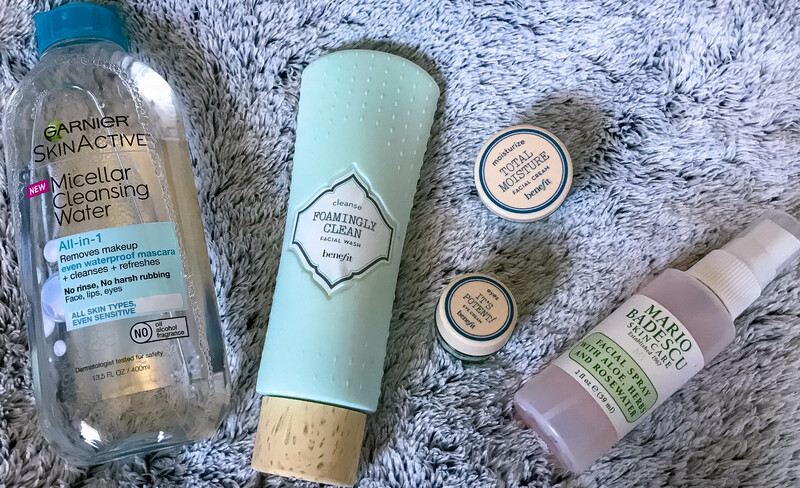 My top favorites were the facial cleanser, the facial cream, and the eye cream- after two weeks of using these products religiously my skin never looked better, I had finally found products that not only fixed my problem spots but made my skin glow and feel healthy again. Now that my backstory is done, my actual skincare routine includes the three products I mentioned above plus some other products that I have recently added. 1. The first step in my skincare routine like most people is to remove my makeup. 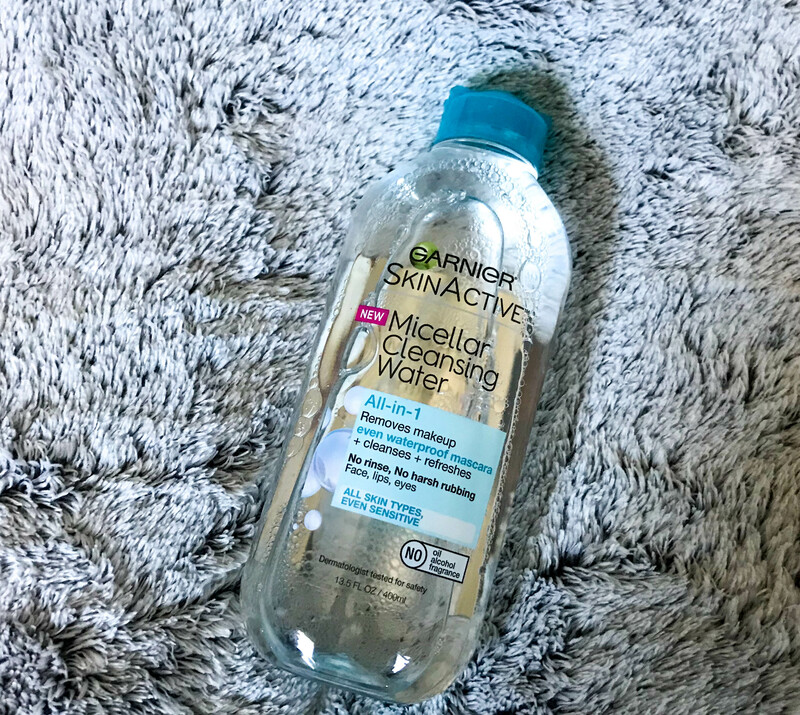 I used to use makeup wipes but I found that they were too harsh for my skin so I switched over to the Garnier Micellar Water- specifically the waterproof version. I find that the micellar water gently removes my makeup and my face does not burn after I use it which is what usually happened if I tried using the makeup wipes. 2. After all of my makeup is removed, I move on to washing my face with the Benefit facial cleanser. This cleanser is a gentle foaming cleanser so it feels very gentle on my face and the foam gets into all of my pores so after I rinse it off my face feels exceptionally clean. After the cleanser is all rinsed off I pat my skin dry with a clean washcloth. 3. Now that my face is fully dry, it’s time to move on to the most important part of my skincare- the creams! 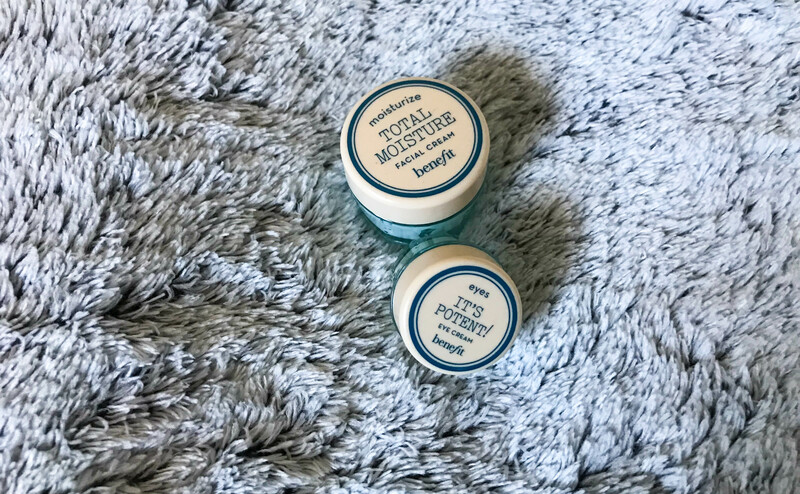 The first one that I use is the Benefit facial cream, with this product a little bit goes a long way so I normally only use about a dime sized amount or smaller for my whole face. After the facial cream is applied, I move on to the eye cream- like the facial cream you do not need to use a little bit goes a long way. 4. 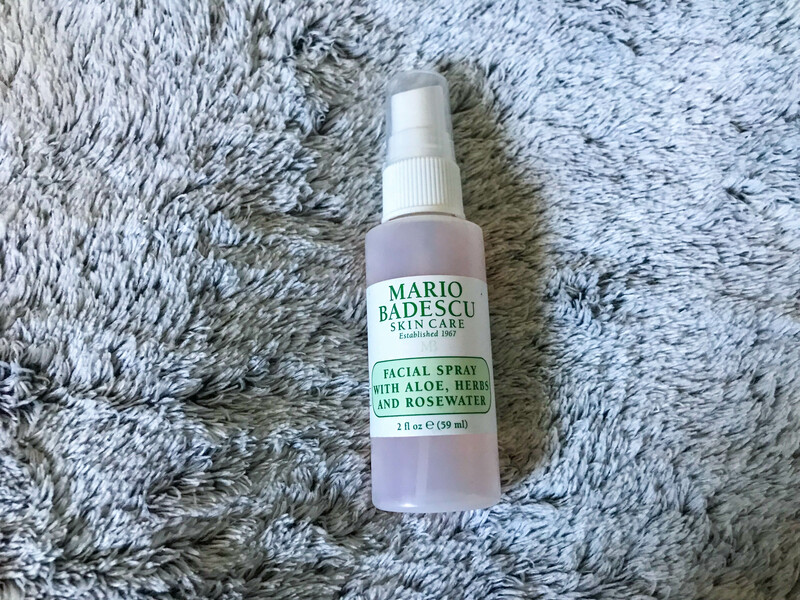 The last thing that I do for my face is spraying it with the Mario Badescu Rose Water Facial Spray. This spray also contains aloe and herbs I can tell that it hydrates and soothes my face of any redness I may be having- plus this spray smells amazing which is a plus!